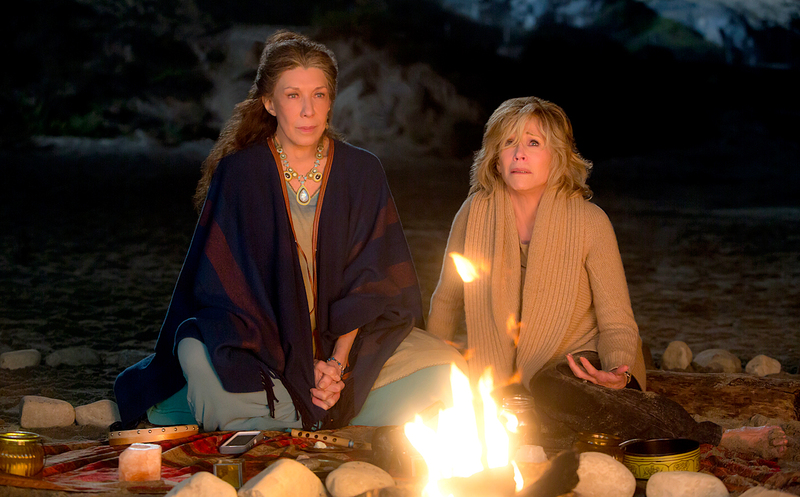 Grace (Jane Fonda) and Frankie (Lily Tomlin) mourn their former lives at the beach. NOTE: This review contains MILD SPOILERS for Season 1. Sometimes the friend you DON’T want is the one you get… and realize you NEED! This is the set-up of the Netflix comedy series starring former 9 to 5 co-stars Jane Fonda and Lily Tomlin. The show is funny (BUT w/ serious undercurrents), smart, sensitive- a MUST-SEE! After their husbands, Robert (Martin Sheen) and Sol (Sam Waterston), leave them for EACH OTHER (becoming NOT only law partners), WASPy perfectionist Grace Hanson (Fonda) is thrown together w/ Jewish hippie Frankie Bergstein (Tomlin). These ladies had dealt w/ each other over the past 30 yrs, BUT never been real friends until BOTH refuse to leave the SoCal beach house that their families invested in together. The two opposites share a lovely beach house. Grace is VERY angry/embarrassed by the situation- how could Robert so something like this to HER!? What will PEOPLE think, she often wonders? Eventually, she realizes that there WERE clues around that he might’ve been gay. Grace goes about creating a new life for herself, which includes online dating (MANY viewers of all ages will relate to this)! Grace has lunch w/ an overeager online suitor. Frankie, on the other hand, is sad and retreats into herself. She burns incense, meditates, and creates vlogs about how she’s feeling. Frankie keeps in touch w/ Sol; they seem like a couple that was best friends (unlike Grace and Robert). Of course, above these strong/capable women’s heads is the (VERY real) possibility of living their remaining years alone. Robert and Sol are VERY much in love, live together, and plan to wed soon. They don’t want to hide anymore. Their four grown-up children are surprised, BUT also have dramas of their own to deal w/, as we eventually learn. The younger gen doesn’t have it ALL figured out either! Grace and Robert’s daughter Mallory (former model Brooklyn Decker) has some serious history w/ Frankie and Sol’s eldest son Coyote (Broadway actor Ethan Embry). There is also Brianna (June Diane Raphael), who has taken over Grace’s cosmetic line. Coyote’s younger brother Bud (up-and-coming comedian Baron Vaughn) is ALSO a lawyer and has his life together; he is helping out Coyote (recently got out of drug rehab). With such a GREAT leading cast, you’re bound to also get some FAB veteran actors as guest stars: Corbin Bernsen (LA Law), Sam Elliott, Ernie Hudson (Ghostbusters), Christine Lahti, Joe Morton (most recently on Scandal), and Craig T. Nelson (Coach).